1) Energy, Waste: Not only are we in dire need of renewable and efficient energy sources, we need to manage our waste production and waste management strategies. Over 150 solar-powered Big Belly trash cans have already been installed in Manhattan. The trash cans are data enabled to send a signal when full. A trial included equipping two trash cans with Wi-Fi, and the results showed that the signal was good despite it being nestled into a trash can. The article mentions Link NYC’s plan to convert old phone booth locations into Wi-Fi sources. It seems that, in the areas that Big Belly trash cans already exist, Link NYC may be able to collaborate with the trash can owners to use the bins as hot spots instead of installing new infrastructure. 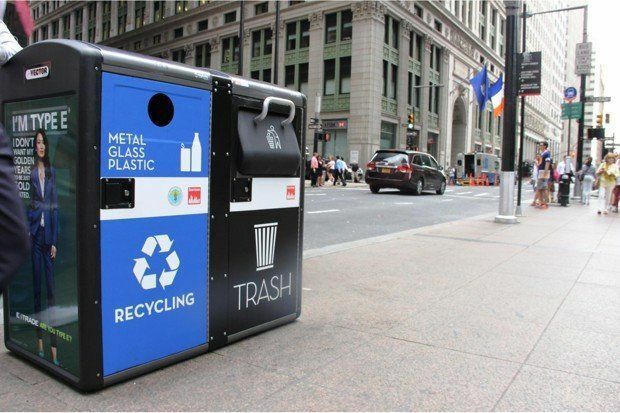 Though this could save Link NYC installation costs, it may also affect Link NYC’s business plan since the Big Belly trash cans tend to be in visible places (like Time’s Square), so Link NYC may miss out on a marketing opportunity by doing this. However, if Big Belly and Link NYC are both aiming to provide free Wi-Fi in NYC, they are going to have to compete if they don’t work together. 3) Organizational stakeholders: NYC government, other city governments, Big Belly, Link NYC, NYC residents, NYC tourists, utility companies, internet companies, wireless companies, etc. Assess feasibility of expanding Wi-Fi capability to more Big Belly bins. Assess the market if Link NYC is also going to be involved in the same market. Assess collaboration opportunities with Link NYC and other entities.